It seems like a long overdue solution to have solared powered traffic lights at major intersections in our country – for two reasons. One of course to prevent traffic chaos when the electricity is out (load shedding is a distant memory, but may happen again) and of course secondly, because they are much more environmentally friendly. 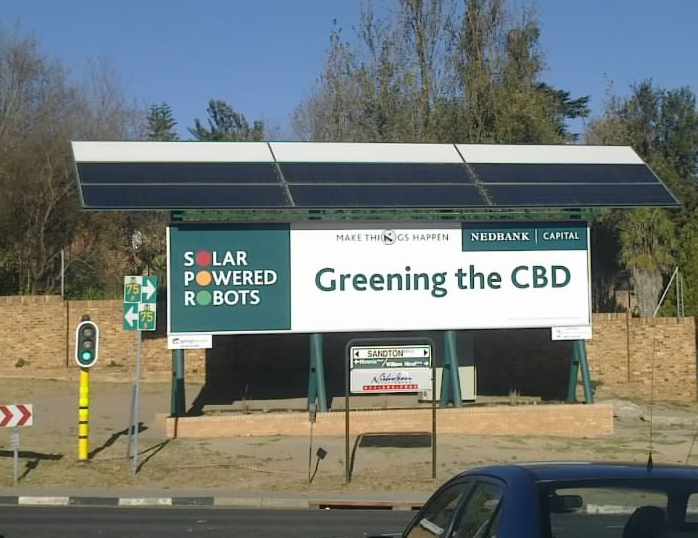 Johannesburg has a number of major intersections that are now solared powered (with some clever marketing opportunities as can be seen from this photo taken on Sandton Drive in Sandton. While they do cost a bit of money to establish, the more of these sorts of functions that are off the grid the better. So – we like solar powered traffic lights (and the Gautrain, public transport and locally grown food) and we still don’t like Hummers, private planes and wasting of electricity. Send us your photos of solar powered traffic lights, billboards etc and we’ll feature them on our Blog. This entry was posted in Energy, Renewable Energy and tagged Johannesburg, Low Carbon, Renewable Energy, south africa. Bookmark the permalink. I come across robots where only one single lane with a small amount of vehicles joining at a T-junction is regulated by how many traffic lights: At least 4 for each side, i.e. 12 in total for a T, excluding the pedestrian signals. In many countries I have been driving such a junction gets one light for each direction only. Another immediate saving option would be to reduce the number of operating hours. Re-think of which road really needs the 24hour regulation? After like 10pm to 6am the robots could just be de-activated or only a yellow-flashing light to each side would be enough.